So this was my first time really playing with this mini size of planner, which is often called "passport" or even "pocket" size and is about 4x5 in. I had purchased this size once a long time ago, when I first started experimenting with Traveler's Notebooks...but didn't really end up using it as I was inexperienced in that style of planner (TN's) and just didn't really know what to do. But now I think I can call myself a pro in TN's and several other types of planners...so I knew what I wanted to do right away! 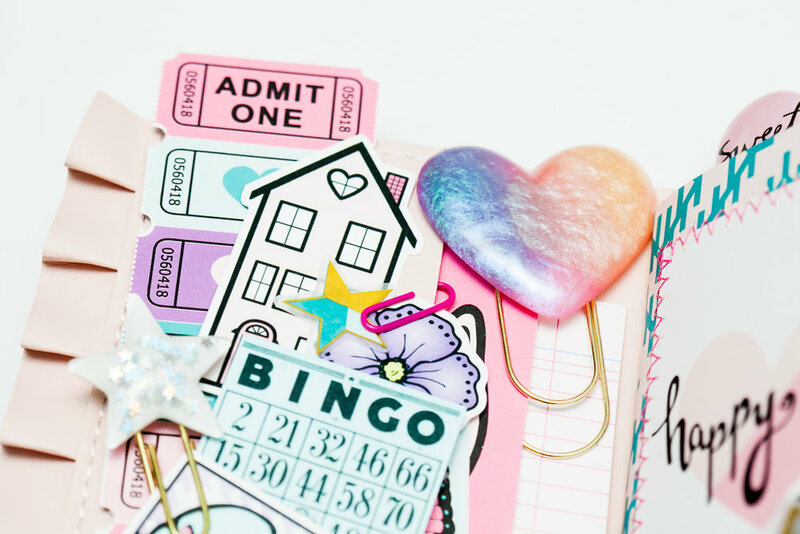 As soon as I got that cute little planner in my hands I knew I wanted to make a couple of adorable little TN inserts for it using my new, beautiful patterned paper from "Happy Day"! And that I wanted to fill up the front pocket with the amazing die-cuts that come in the kit's ephemera pack! First, I started with the front pocket decorating. This is what I do when I am setting up all of my planners...no matter what the size....I start with the front pocket. I pulled out the ephemera pack and started grabbing some of my fave pieces (like the little bingo card and the cameo girl) and putting them aside for the pocket. However, because there is only one side pocket for the front of this mini planner, I had to do things a little differently than I usually do with my other larger TN's and ringed planners. And since there weren't a lot of front facing pockets to tuck the little ephemera into, I had to improvise and use paperclips to attach the die-cuts to the front. This worked out fine and looks super cute! I also added a row of tickets to the front which I cut out from the "Ticket to Ride" patterned paper in the "Happy Day" kit. I did go ahead and use the side pocket too for some bigger items, like a few of the cards from the cut-apart sheets...which I just tucked into the pocket so they would peak out a bit. And to finish up, I used some of the shimmering gold foiled stickers that come in the kit and placed them strategically, here and there, for a little added glow! That's enough about the front pocket set-up...now let's talk about the inserts! I created the little inserts for my teeny-tiny TN planner using the "Happy Day" patterned paper and the "On Hold, Hold On" patterned paper for the covers. To decorate each of my inserts, I used a couple of 3x4 cards from the cute cut-apart sheets that come in the kit. On the first insert, I decided to use the card that says "happy day" on it. I stitched the card to the insert cover using my sewing machine and a zig-zag stitch. It looks way cute! On the second insert, I did the same thing, but used the card with the sweet little blue house on it. Also way cute, btw! :-) I love how both of them turned out! On the back of each of the inserts, I decided to also paperclip a couple of the cute little tags that come in the cut-apart sheet. Like the one with my cute little kitty on it, and the one that says "love". It just adds a nice little touch, and a little more interest, to the back of each of the inserts. Oh, and to the front of the first insert, I decided to add even more interest and depth by using a little layered butterfly embellishment that I created using the gold-foil vellum butterfly sticker, a clear piece of acetate that I stuck it to, the purple butterfly ephemera piece, and some stitching! I just folded the butterfly wings...and voila! It just pops off the page...this really cool 3-D butterfly that is just sitting on my insert! Yay! Inside the inserts, in order to mark certain pages, I created some decorative paperclips using the awesome flair buttons that come in the kit. I love making decorative paperclips with that flair! I decided for these paperclips, to use the heart flair button, the butterfly one, and the one that says "sweet" on it...which may be my favorite! 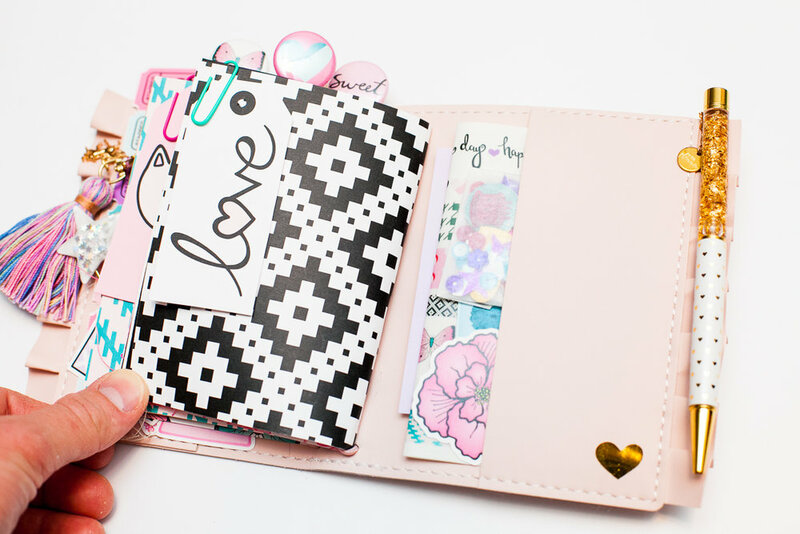 They peak out above the top of the inserts and the mini planner and just look so lovely! They really call out to you to reach out and touch them and turn to those pages! So perfect to use to mark your place...or specific pages that are of particular importance! And to the back pocket of the planner I also tucked in some more of the cards from the cut-apart sheets, and also the washi-tape strips from the kit and the sequin pack. Oh, and I added one of the gold heart stickers directly to the mini-planner. That's about it! I used a cool gold glittery pen...to add a little more gold...cuz, why not?! And I also added a cool new giant heart paperclip I got from The Gilded Roo (at Planner Con), and a little star paperclip I got from Shimelle (at Creativation)...moment to shout out to both of those awesome ladies for hooking me up with super cute goodies like that when I met them...and for being so nice too!!! Thank you!!! Oh, and to tie it all together, I used the multi-colored unicorn tassel clip that is from Haute Pink Fluff (and which you can find in a couple of our previous kits). Okie dokie...I think that is all for now! 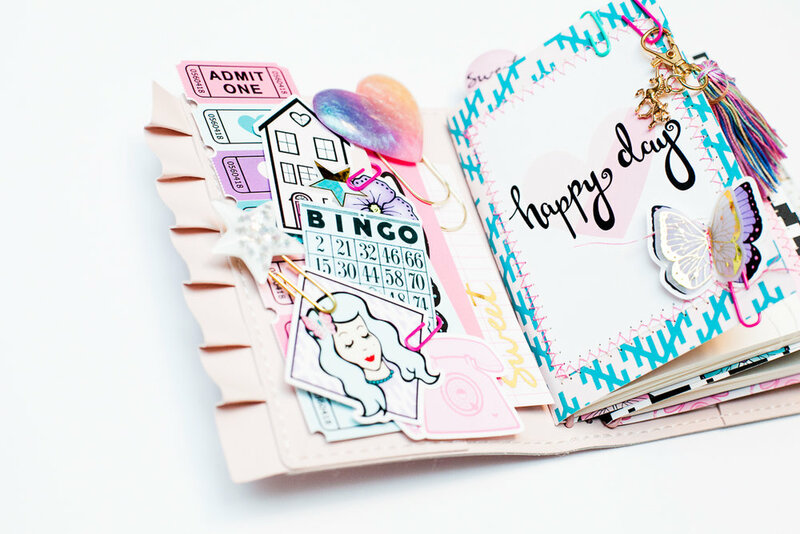 I hope you enjoyed this post and my cute new teeny-tiny TN planner set-up using the "Happy Day" kit! I know I do!!! Hugs to everyone! And remember to live your life as a fairytale!! !